Glaucoma is a group of eye disorders leading to progressive damage to the optic nerve, and is characterized by loss of nerve tissue resulting in loss of vision. The optic nerve is a bundle of about one million individual nerve fibers and transmits the visual signals from the eye to the brain. The most common form of glaucoma, primary open-angle glaucoma, is associated with an increase in the fluid pressure inside the eye. This increase in pressure may cause progressive damage to the optic nerve and loss of nerve fibers. Vision loss may result. Advanced glaucoma may even cause blindness. Not everyone with high eye pressure will develop glaucoma, and many people with normal eye pressure will develop glaucoma. When the pressure inside an eye is too high for that particular optic nerve, whatever that pressure measurement may be, glaucoma will develop.Glaucoma is the second leading cause of blindness in the U.S. It most often occurs in people over age 40, although a congenital or infantile form of glaucoma exists. People with a family history of glaucoma, African Americans over the age of 40, and Hispanics over the age of 60 are at an increased risk of developing glaucoma. Other risk factors include thinner corneas, chronic eye inflammation, and using medications that increase the pressure in the eyes.The most common form of glaucoma, primary open-angle glaucoma, develops slowly and usually without any symptoms. Many people do not become aware they have the condition until significant vision loss has occurred. It initially affects peripheral or side vision, but can advance to central vision loss. If left untreated, glaucoma can lead to significant loss of vision in both eyes, and may even lead to blindness.A less common type of glaucoma, acute angle closure glaucoma, usually occurs abruptly due to a rapid increase of pressure in the eye. Its symptoms may include severe eye pain, nausea, redness in the eye, seeing colored rings around lights, and blurred vision. This condition is an ocular emergency, and medical attention should be sought immediately, as severe vision loss can occur quickly.Glaucoma cannot currently be prevented, but if diagnosed and treated early it can usually be controlled. 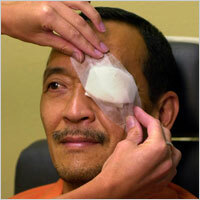 Medication or surgery can slow or prevent further vision loss. However, vision already lost to glaucoma cannot be restored. That is why the American Optometric Association recommends an annual dilated eye examination for people at risk for glaucoma as a preventive eye care measure. Depending on your specific condition, your doctor may recommend more frequent examinations. Glaucoma is the leading cause of blindness among Hispanics. exact cause is unknown. Although the disease is usually associated with an increase in the fluid pressure inside the eye, other theories include lack of adequate blood supply to the nerve.